The C4Leader Blog: "In Six Months..."
This was my first meeting with the LTC, and he seemed like a nice enough guy. I also knew that I would need an Executive Officer (XO) slot of a Army Company (roughly 100 soldiers and millions of dollars of equipment) or an S-6 (think IT department head) of a Battalion (roughly 500 to 1000 people) in order to advance to the rank of Major. At the time I was a 1st Lieutenant (1LT) on the promotion list to Captain, and there were five other 1LTs who made the move from a combat arms branch into Signal Corps with me. The other significant requirement to advance beyond Captain was attendance at the Captain's Career Course (CCC), usually a change of duty stations occurs after completion. Two (2) years later, I was still in the same supporting position while the 5 other officers moved on to the promised XO and S-6 positions, as well as the CCC. Why was I still in the position? Was I under-performing in comparison to my compatriots? Did they have a different skill set that allowed for advancement? The actual answer is a little difficult, so let me provide some background. The unit was in between deployments and was deep in the training cycle. The unit was responsible for Division Level communications, meaning that every Battalion and Brigade (thousands of soldiers) provided updates through our Unit to the Divisions Command Group (think tens of thousands of soldiers). As each of these Battalions and Brigades spent time in the field, it meant that our unit was in the field with them providing communications back to the base. This requires an Officer in Charge (OIC) for the day shift, and another for the night shift, typically Senior Captains or Majors. These OICs need to be able to assess situations, listen to the people on the ground, and make quick decision, in order to maintain or fix communications. I spent the next two years running the night shift operations for the Division's communication network; first at Fort Hood, then in Baghdad, Iraq. This is an important job, but one that many personnel could have performed. In point of fact, several Captains rotated into and out of the unit during my time that could have performed the duty. The reason I was kept was that I made the LTC look good. I learned the systems quickly, was willing to take chances to fix problems, and even wrote some of the Standard Operating Procedures used throughout the Division for the communications equipment. I reported not only to the LTC, but to full Colonels and Generals. With a wartime deployment coming, I was deemed "mission critical" by the LTC, and thus held in the same position. During that two year period I was approached by several Brigade Commanders asking me to take over positions in their units (as my reputation was established at the Division Level). These would have been career advancing positions, well above the expected level of a (then) junior captain. I requested permission to move to these positions, only to be denied by the same LTC. The branch office (responsible for ensuring personnel have the appropriate training, and assigns duty locations after the training) requested that I attend CCC prior to the deployment, again denied by the LTC because I was "mission critical" to the upcoming training and deployment. The unfortunate news is that I wasn't the only one who was held up by this particular LTC. I had two Staff Sergeants working for me who required additional training for advancement, that were denied. I know of another three Sergeants and one Lieutenant who were held up as well, all deemed "mission critical." In reality, we each provided rapid response in the positions we held and made the LTC look good. We could have been replaced, probably with minimal impact after a learning curve, but the LTC "needed" to look good for his reviews, so we stayed. About two-thirds through our deployment to Iraq, my detachment (the Divisions Communication Staff) changed from one LTC to another. We remained part of the same Battalion, but this time we reported to the Division IT Manager (called G-6). The G-6 interviewed each of us, and was shocked to find out that I was (1) a Junior Captain, and (2) that I was in the same position for more than a year and a half (at that time), without attending the CCC. He immediately offered me a Battalion S-6 job in Iraq. I had a decision to make: take the career advancing position (finally) or stay where I was and probably leave the Army. I decided against it. The reasons were simple. I was already at least 1-2 years behind everybody else in my promotion group, as they had already held the S-6 position (or XO) and moved on to the CCC and were in other assignments. I would be just starting what I should have been doing as a 1LT. If I took the S-6 job, I would be in another mission critical position until the redeployment cycle was complete, and would have to wait for the next CCC course to start (putting me at least 3 years behind my peers). The difficulty with being so far behind is that even if you have the highest marks on your evaluations (I did), without the proper positions and training a 3 year gap means you are the last to be promoted in your peer group, and thus impacts each future promotion for the duration of the career. In addition, the branch office would probably send me to the next unit returning to Iraq after I completed CCC. Since I had been twice already, I thought it was enough. Because of these factors (among other things), I decided it was time to get out of the Army. In the end, it was too little, too late. a. If they realize they are too good to promote they may leave your team simply to get farther in their career, or if they stick around they may resent that they are being held in place. b. As a leader, you don't want to find yourself in a position where you have to rely on one person for a function. What happens if they win the lottery or get sick? What type of recovery plan is required to take over for that one person? In answer to number 1, as a leader, you shouldn't be creating mere followers. Instead you should be creating more leaders. 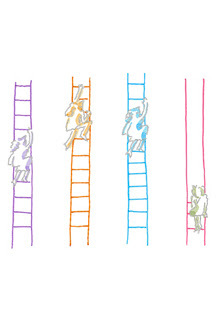 You should be placing more rungs in the ladder for them. This means helping your people gain the training they require to improve, and pushing them to advance, unlike the LTC who held several people (myself included) in the same position because we made it easier for him. All of our careers were hurt, and most of us left the Army after that deployment. Don't let this happen to your team. Instead, interview your team members (COMMUNICATE), and learn where they want to go. Help them plan out the progression and training to get there, then push them to complete it, even if it is your job. After all, you will need a replacement eventually, if you want to grow as a leaders as well. This is part of being in COMMAND. 2. Are you in a position where you are too good to be promoted? Have you made yourself un-promotable by being indispensable? In answer to number 2, if you are in this position, then the first step is to discuss your situation with your boss. They may not realize that you feel stuck or unhappy (that rungs are missing). In most cases, I've found that the managers rarely realize that their personnel feel this way (my particular experience is the exception). Talk with them about the training and experiences you want/need to advance. They cannot help you if you don't talk with them. If they respond negatively, or brush you off, then perhaps it is time to start looking elsewhere. Otherwise, it is unlikely that you will see a change until the management changes. The Army has something called "stop-loss" which means personnel assigned to a deploying unit cannot leave the military. Unfortunately, by the time my 6 month window was up, I was in the stop-loss window. I couldn't leave the Army (although I could have gone to CCC and/or changed jobs within the same unit). You probably don't have this limitation (however, you may be under contract for a period of time). Explore your options and determine if you can grow somewhere else. 3. The last lesson I learned from this extended experience is that YOU are responsible for your own career. No one else is responsible for your advancement. You may find people who help you along the way (I certainly hope you do); but it is up to YOU to make the moves necessary to get where you want to be. Nobody else will look after it for you. This sure sounds familiar. Many people get stuck in a job for being "mission critical" both in and out of the military. Bob, I would imagine that its much more common than people want to believe. One of the reasons to share my experience. I hope you aren't currently stuck. Thank you for posting a comment.